See also: Anti-Saloon League; Turlington Act. The temperance movement in North Carolina, which had as its goal the elimination or severe restriction of alcoholic beverage consumption in the state, is often equated with the formation of temperance societies, beginning in Guilford County in 1822. Yet a governmental regulatory measure that addressed public drunkenness appeared as early as 1715. This law also required any person who wished to retail liquor that was not produced on a farm to obtain a license from the governor. Other laws restricted "tippling houses" (later called "saloons") by compelling all liquor retailers to furnish food and lodging for their guests and gave county courts the power to grant liquor licenses. In the late eighteenth century, Protestant ministers, church organizations, and a variety of churchgoers (especially Baptists, Methodists, and Presbyterians) launched their own crusades against public drunkenness and disorderly conduct. Two years after the organization of the American Temperance Society in Boston in 1826, two societies in North Carolina affiliated with the national organization appeared. Four years later there were 31 affiliates, including the Orange County Temperance Society, founded in Hillsborough in 1829. The Asheville Temperance Society, organized in April 1831, was the first in the western region of the state. The Pleasant Hill Temperance Society of Alamance County, formed about 1833, existed for more than 75 years. The North Carolina Temperance Society, created in 1839, sought to bring the scattered local units into an effective state organization but did not succeed. The Washingtonian movement, which originated in Baltimore, came to North Carolina in 1841, followed by the Sons of Temperance in 1843. The Sons was a beneficial as well as a temperance association, retaining the total abstinence pledge of the Washingtonians. Other societies included the Daughters of Temperance, introduced at Raleigh in 1848, and the Cadets of Temperance, an outgrowth of the Sons of Temperance, which began in Wadesboro in 1849. The Woman's Christian Temperance Union (WCTU), the most prominent temperance society in North Carolina after the Civil War, was organized at Greensboro in 1883 by Frances E. Willard, president of the national WCTU. Its wide range of reform programs included women suffrage, equal rights, child welfare, prison life, international arbitration, world peace, narcotics and tobacco control, child labor, juvenile delinquency, prostitution, and gambling. Two WCTU publications appeared in the state: the Anchor and the North Carolina White Ribbon. The Civil War only temporarily stopped the activism for legal measures to eradicate the evils attributed to the liquor traffic. In 1881 the General Assembly reacted to this pressure by authorizing a referendum on prohibition statewide. The result was the crushing defeat of temperance proponents by a vote of 166,325 to 48,370. Yet the issue was not dead. Prohibitionists went to work in their own communities, and by 1900 they had eliminated legal liquor sales in many rural areas and small towns by means of local referendums. They were further strengthened in 1902, when the North Carolina Anti-Saloon League was established. Other events favored the prohibitionists-the Democratic Party became decidedly dry, the Watts Act of 1903 outlawed rural distilleries, and the Ward Law of 1905 dried up all but the state's 80 towns with populations of 1,000 or more. A second referendum on statewide prohibition was set for May 1908, with Governor Robert B. Glenn leading the antiliquor campaign. The temperance forces carried the day (by a vote of 113,612 to 69,416), and North Carolina went dry in 1909, a decade before the Eighteenth Amendment established national Prohibition. North Carolina thus became the first state to adopt Prohibition by a direct vote of the people. The state retained its antiliquor law for four years after the nation passed the Twenty-first Amendment ending Prohibition. Legal liquor returned to the state in 1935, when in its closing hours the General Assembly passed the Pasquotank Act, which permitted counties to sell liquor in state-owned stores regulated by an alcoholic control board. In 1937 a statewide local-option law was enacted. In that year the State Board of Alcoholic Control was created by the General Assembly "to establish a system of control over beverages whose alcoholic content exceeded 21 percent." The act included regulation of the manufacture, sale, and possession of these beverages, and no county could sell liquor without approval of its voter majority. By legislative acts of 1935, 1945, and 1949 the board, which changed its name to the North Carolina Alcoholic Beverage Control (ABC) Commission, also obtained authority to regulate the consumption of wine, beer, and other malt beverages and sold liquor through ABCstores, which were given control of all aspects of whiskey production, possession, and sale in the state. In the 1970s the legislature approved "liquor-by-the-drink" at bars and restaurants, subject to local laws and limitations. Daniel Jay Whitener, "History of the Temperance Movement in North Carolina, 1715 to 1908" (Ph.D. diss, UNC-Chapel Hill, 1932). Whitener, Prohibition in North Carolina, 1715-1945 (1945). 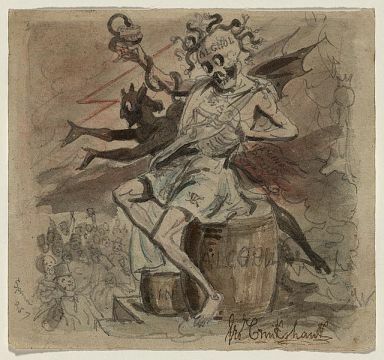 "Alcohol, Death, and the Devil", created between 1830 and 1840 by George Cruikshank. Image courtesy of Library of Congress. Available from http://www.loc.gov/pictures/item/2003674027/ (accessed June 1, 2012).